It’s important to know the difference between correlation and causation when using charts. Duh. Below is a good example of why. hah! Nice chart! Definitely no causation here. But almost certainly a real relationship. Agreed any connection between these two things seems on its face ridiculous but still, at an R of .9971 the correlation between the two is incredibly robust. More likely than not the two are either entirely unrelated (just “related” by data set “cherry picking”), or maybe both related to some other independent factor, but how can you state without absolute certainty that there is no causation here? For example, can you really say for certain that there is no naturally occurring plant or animal toxin present in organic foods thats a contributing factor to autism? @looking closely, you should develop a theoretical argument for WHY that relationship might be the case and that it should be more compelling (more evidence, more consistent) than arguments for OTHER relationships. 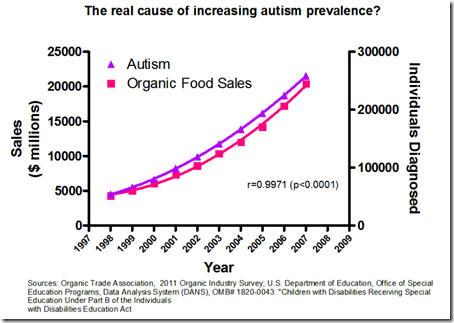 Far more likely explanations include either (a) an increase in ASD diagnoses (NB: not just individuals with an ASD) led to in increase in organic food sales thanks to concerns about environmental exposure to synthetic toxins contributing to autism, (b) increased awareness of the potential impact of environmental exposure to synthetic toxins led to a concurrent increase in the sales of organic produce and ASD diagnoses, or (c) families had more disposable income from the late 90s into the late aughts to spend on more expensive, higher quality foods and identifying and seeking services for previously unidentified ASD. I find it hard to imagine that there is a significantly higher rate of exposure to naturally occurring toxins than there was in the past. Granted the chart only goes back to 1997 but to support that argument you would also expect to see evidence of a relatively high rate of people exhibiting ASD characteristics before the Green Revolution as well as high rates of people exhibiting ASD behavior in parts of the world that the Green Revolution skipped over and they’ve always eaten food without synthetic fertilizers and pesticides.